Nathan Shapell, is the Founder, Chairman of the Board and CEO of Shapell Industries in Beverly Hills, California. One of the few members of his family to survive the Nazi concentration camps in World War ll, Shapell began his building career at age 22, constructing houses for Displaced Persons after his liberation from Auschwitz. He organized a noted community for refugees in Germany and later developed a successful textile business there. "My wife, Lilly, and I wanted to immigrate from Germany," he recalls. "We read about California in Life magazine and wanted to visit there before we settled down somewhere. When we got to California, we fell in love with it." 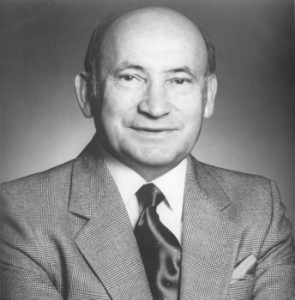 In 1955, he founded Shapell Industries along with his brother David Shapell and brother-in-law Max Webb, and engaged in diversified financial and real estate development throughout California. Since the company's inception, Shapell Industries has built nearly 80,000 houses. Today, the company employs about 400 people. Among Shapell's signature projects are Gale Ranch in San Ramon, and Porter Ranch in the San Fernando Valley. Initial construction at the 4,000-acre master planned community of Porter Ranch began in 1974. At build-out, the community will have 7,500 homes and 3 million square feet of commercial space. Shapell prizes the reputation his firm has earned for building high-quality residential and commercial projects. "Because of our reputation, we advertise much less than other builders," he says. "People hear about us from others who are satisfied with a home we built." In 1969, Shapell took the company public, with stock traded on the New York Stock Exchange and the Pacific Stock Exchange. In 1984, the company reverted to private ownership. "To my knowledge, we were the only building company on the New York Stock Exchange to go private," Shapell says. "I wanted to be liberated again." Numerous civic and philanthropic organizations have benefited from Shapell's support. He was the longest-serving Commissioner in state government in the 20th century, having served as a member of the Commission on California State Government Organization and Economy (known as "The Little Hoover Commission"), from 1969 to 1997, and chaired the Commission from 1976 to 1994. "The main change the Little Hoover Commission made was to ask, Who's accountable," Shapell says. Under his leadership, the Commission issued scores of reports with hundreds of recommendations that the Legislature and Governor have implemented to save California billions of dollars. Among other accomplishments, the Commission led the fight for major reform of the nursing home, board and care, and children's services industries. "The Little Hoover Commission" was important not just for California, but for the federal government, too," Shapell adds. When Ronald Reagan became President, he initiated a similar reform effort, establishing the Private Sector Survey on Cost Control (known as "The Grace Commission"). Shapell was appointed to the Grace Commission by President Reagan in 1982, and contributed to improved management and efficiency that saved tax payers billions of dollars. In 1980, Shapell became Chairman of California's Task Force on Affordable Housing, which developed recommendations that led to a significant increase in affordable housing units throughout the state. He also co-founded "Building a Better Los Angeles," a nonprofit corporation, and personally raised more than $1 million to assist programs serving homeless children and families. ​Shapell's first person history chronicling his life during and immediately following the Holocaust, Witness to the Truth, was published in 1974. Presidents Bush and Clinton each appointed him as a member of United States Holocaust Memorial Council and, in 1994, Shapell represented Holocaust Survivors Worldwide at a candle lighting ceremony in the Vatican for the first "Papal Concert to Commemorate the Holocaust." Shapell holds honorary doctorates from Santa Clara University and University of Tel Aviv in recognition of his humanitarian work.